Mrs. Hester's Classroom : My First PBL Unit - Day 4! We ended the previous class by recorded our large set of data into our notebooks. We began this class by finding the percentages of each response for every person surveyed this far, our class and our large group. I have students the following information to help them format their page and guide their calculations. I asked the question "is it possible for all 5 people that I randomly select to choose a?" They all agreed yes, that's possible. I then asked "is it more or less likely that all people choose a if I randomly select 20 people?" Everyone agreed that was less likely to happen, although still possible. This lead us down a discussion path about larger sample size = more accurate information. 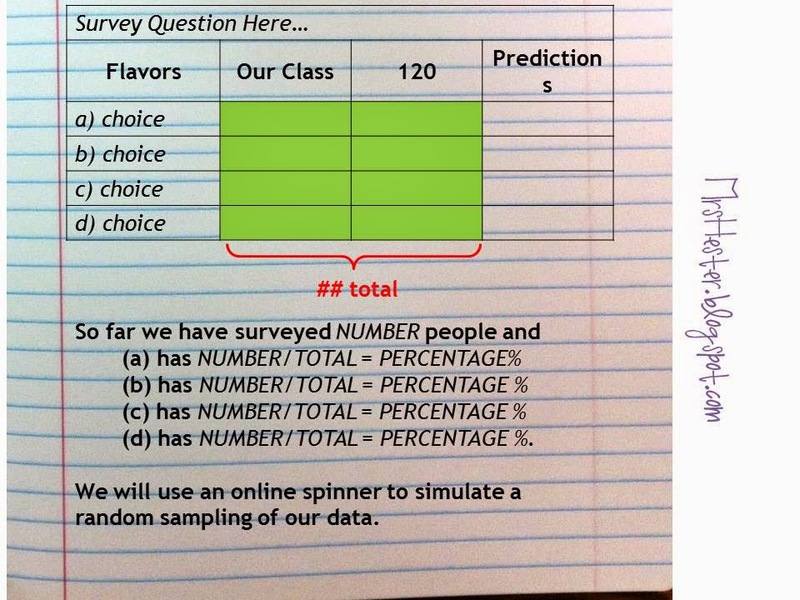 After I felt like students had a grasp of what that last sentence meant, and why we were going to simulate random samples, we used the spinner feature on Math Is Fun, found here. 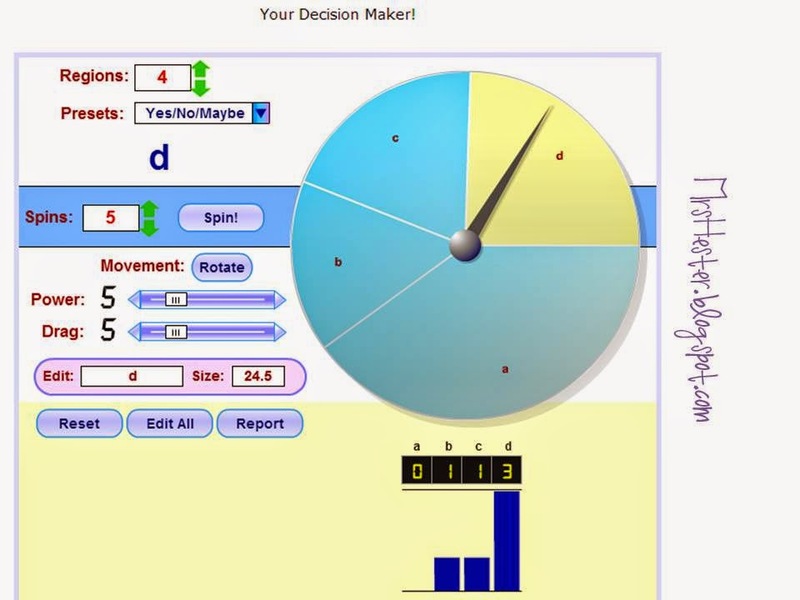 I chose this spinner because it was very user friendly and allowed my students to easily manipulate the section percentages. I demonstrated on the projector how to change the percentages to match those that each group just calculated. Once each group set the percentages and clicked "update," we were ready to simulate! I showed how you can set the number of spins, simulating how many people we were choosing at a time. The bar graph under the spinner records the results. I also stressed the importance of hitting the reset button between each random sampling, otherwise the graph would just continue counting and we wouldn't have accurate results. One person in each group usually took it upon themselves to make sure reset was pushed each time. You would hear "RESET!" from across the room at random times. It was pretty funny!! 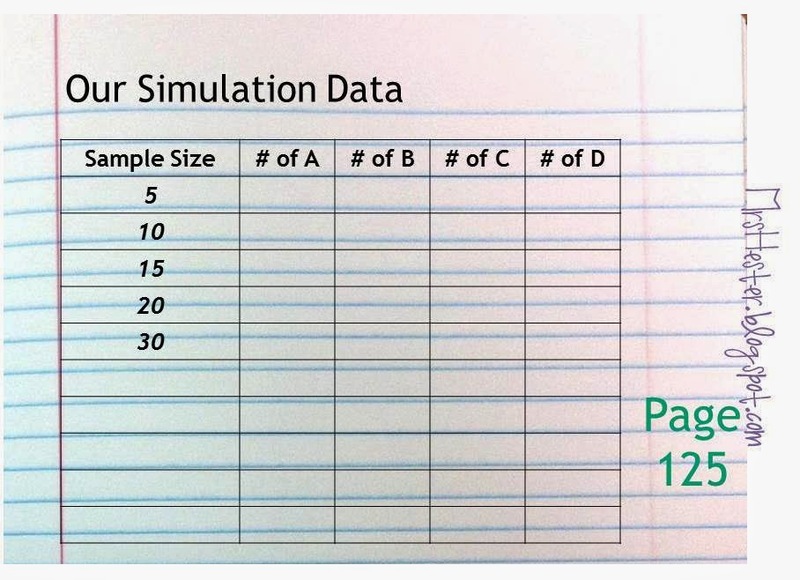 We recorded our simulation results on page 125 in our notebooks. I showed this to help with formatting. 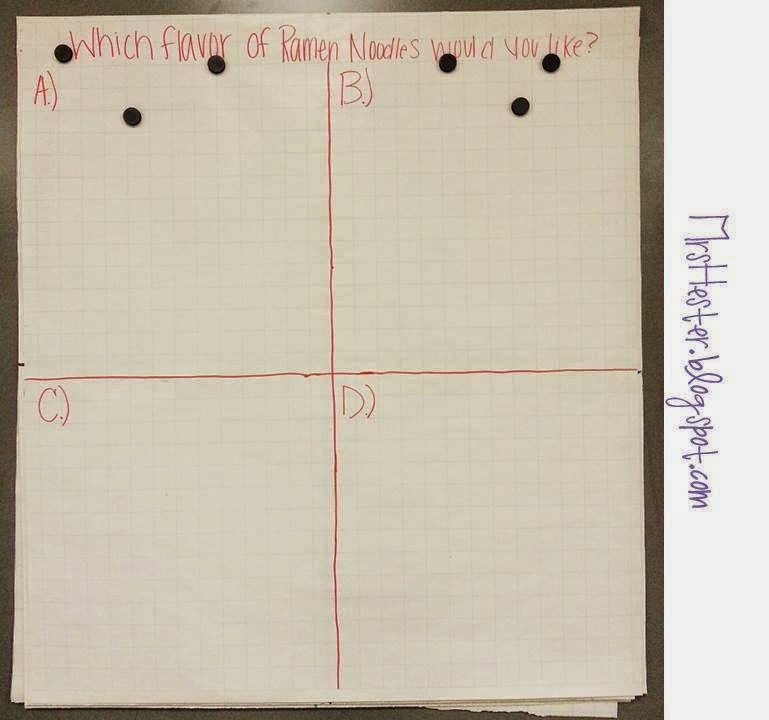 We didn't have time to start our scatter plots yet, but groups did set up their large grid paper in preparation for graphing. Here's one so you can get the idea. We'll start creating our scatter plots using simulation data next class!! My students are taking their MAP Test and then going on job shadowing before I see them again for math content. :( It will be about a week before we get back to this project. So... now that I'm really into my first PBL unit, do you have any advise or pointers? Any things you would have done differently than me? I am completely open to suggestions! UPDATE: Day 5&6 are here!